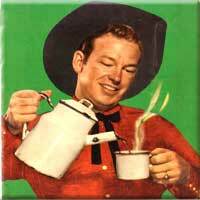 Nothing better to start the mornin' then a cup of Old Joe, Java, Black Gold, also known as coffee. For you serious caffeine sufferers, you will want a Mammoth Red Eye. That is the only hot beverage that will get you skiing early when the bell rings in the AM. It's a couple of shots of espresso in black coffee. Mmmm. Coffee shops in Mammoth Lakes do it even better. Long time favoriate is Looney Bean, the only local roaster in town. They import their beans (well everything in Mammoth is imported....) and they roast them right in town. When the roaster is going you can smell that great French Roast as it wafts through the air. The baked goods are fresh, homemade and delicious. We all like our coffee our own way, so we have alternatives including Stellar Brew, fast on the heels of Looney Bean in the running for the #1 coffee shop in the Mammoth Lakes restaurant guide. We also have several Starbucks doing the commercial sort of pour. Many of the coffee houses also have internet in Mammoth in case you want to hang out rather than just grab a cup and go. So when you're on your way out to the lakes before the sunrises, or getting up for the bell ringing first run on Mammoth Mountain, stop by one of our local coffee houses in Mammoth Lakes and get that latte to go.